At least 10,900 Los Angeles County residents fall into homelessness every month, according to a report released this week by the research nonprofit Economic Roundtable. While a majority of those people are able to find a new home on their own and avoid long-term homelessness, many are not: about 43 percent remain homeless for a year or more. That's a problem, according to the researchers, whose report had initially been blocked from release by L.A. County officials who contended the nonprofit misused data the county provided. 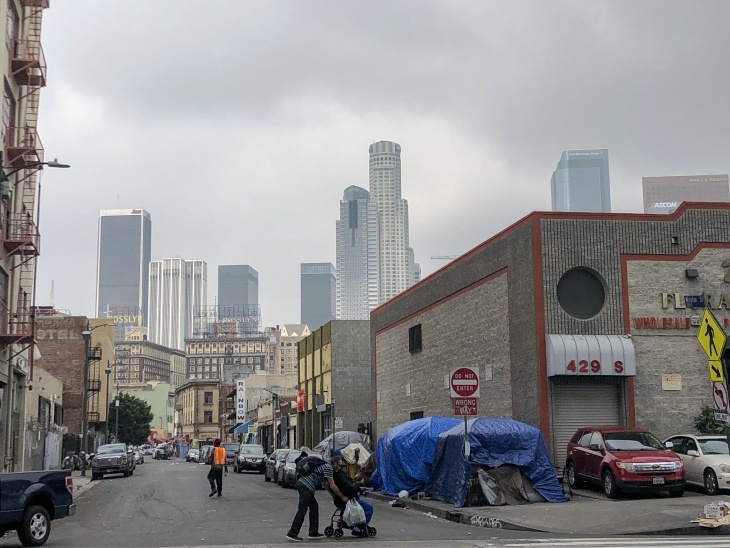 The report, made public after negotiations first reported by the L.A. Times, says Los Angeles should shift its anti-homelessness strategy to prioritize early intervention. In other words, target populations most likely to fall into chronic homelessness and get them help before they've spent months or years on street. That's different from the "progressive engagement" model typically used to help the homeless, which gradually offers more assistance to people the longer they remain on the street. "The problem is that by the time people get intensive interventions like a permanently subsidized housing unit, they have gone through a lot of suffering, and there is a lot of damage in their life that is very difficult to undo," said Daniel Flaming, one of the report's authors and president of Economic Roundtable. "We have to reduce the flow of people into chronic homelessness for housing strategies to successfully clear the sidewalks of people living on them." The core disagreement is over whether you can predict who will and won't fall into chronic homelessness. The "progressive engagement" strategy set by national policymakers holds that there is no way to accurately predict who will fall into chronic homelessness. Having that be the starting point is key because available public resources for helping the homeless are outmatched by need. It follows that if you cannot predict who will have the greatest need — who won't be able to help themselves out of homelessness — holding on to those resources to give to those who have been homeless for a long time is a better use. Report authors disagree, and say it is possible to predict who is most likely become chronically homeless with a high degree of accuracy. They argue that not helping those people immediately ends up costing the government more money in the long run; citing health care, emergency response, and the justice system. "Early intervention for high-risk individuals is important because the longer people remain homeless, the more social disconnection and legal, medical and behavioral health problems emerge and grow as increasingly formidable barriers to escaping homelessness," the report says. To an extent, Los Angeles County has been doing just this in bits and spurts since voters passed Measure H in 2017. The county has expanded resources available for recently emancipated foster youth, and is piloting jail "in-reach" programs that identify inmates with a history of homelessness, and work with them to avoid homelessness before release. It is also exapanding rapid re-housing programs that targets people who recently became homeless with rental subsidies and hotel vouchers. Measure H raises about $350 million for homeless services each year — which works out to about $6,600 per houseless person in L.A. County. In all, voters have approved nearly $5 billion in funds specifically for addressing homelessness, it is still a relatively small amount of money when compared to the scale of need in Los Angeles. For the time being, homeless people who are admitted to the Los Angeles County's homeless services infrastructure — usually after a homeless outreach worker interviews them — typically get a referral to the county's general relief program (which provides a monthly $221 check) and other public assistance programs for poor Californians like SNAP food stamps and Medi-Cal. The report's authors argue addressing the needs of people at high risk of chronic homelessness would be a smart way to supplement existing homeless services in L.A. Essentially, they point out that acting earlier saves money later.